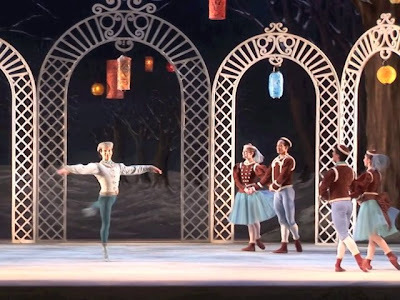 The second part of the Kennedy Center's Ballet Across America festival (see Part 1) had the choreography that really caught my eye, Frederick Ashton's classic Les Patineurs. Overall it was likely the high point of the week because of the combination of Ashton's skating ballet, made for Sadler's Wells in 1937, with a Philip Glass choreography, Wunderland, and more Balanchine, The Four Temperaments. The impetus for Les Patineurs was some of the music from Giacomo Meyerbeer's Le Prophète, an 1849 grand opera which had featured an ice-skating interlude leading into Act III. Sadly, Ashton did not follow that ballet's example of having the corps dance on roller skates, which had become a fad in Paris that year, but Les Patineurs, in this revival presented by Sarasota Ballet, is an unabashedly sentimental, even corny choreography that cannot but bring a smile to your face. The idea is ingeniously simple: a frozen lake surrounded by snow-touched trees, some white gates and colorful lamps, and a corps and soloists in pairs or alone all mimicking skating on the blue floor (sets and costumes were loaned by the Birmingham Royal Ballet). At one point snow falls, at others sudden stops in the music are accompanied by pratfalls of the skaters. The dancing was all quite fine, led by the Blue Boy of Logan Learned, an energetic role that included some athletic acrobatics, and the elegant White Couple of Danielle Brown and Ricardo Graziano. Two pairs of women, one costumed in blue and the other in red, provide occasional comic relief, all to Meyerbeer's music, much of which borders on pedestrian but with the dancing is magnified in interest, played well by the Kennedy Center Opera House Orchestra under the baton of Ormsby Wilkins. Septime Webre and the Washington Ballet brought Edwaard Liang's choreography Wunderland, premiered in 2009. Here the music -- excerpts from Philip Glass's second, third, and fifth string quartets -- was played by a selection of the Opera House Orchestra players, plus talented pianist Lisa Emenheiser, a performance that unfortunately had to be amplified (noisy page turns and all). Liang's work was much busier than Les Patineurs, and the repeated gestures of Glass's music were matched with geometric movements, often striking but just as often seeming to fill time. The orchestra returned for the Pennsylvania Ballet's revival of George Balanchine's The Four Temperaments, with an evocative score by Paul Hindemith, conducted by Beatrice Jona Affron. A rather serious work, with dances that illustrate the medieval concept of the bodily humors, it would have benefited from being placed first on the program, while Les Patineurs would be enchanting at any point in the evening. This program is repeated twice on Saturday (June 8, 1:30 and 7:30 pm) in the Kennedy Center Opera House. The Ballet Across America festival continues through June 9.